The Apple TV 3 and the new Apple TV 4 has upgraded with support for Dolby Digital Plus™ audio up to 7.1 channels and Dolby® Digital audio up to 5.1 channels, which enables content providers to use Dolby Audio™ to deliver even richer and more immersive experiences to Apple TV 3 and Apple TV 4. Have some online downloaded AVI files on your local Mac computer and wish to stream the AVI files to Apple TV 3/4 with Dolby Digital 5.1 surround sound. The following article will walk you through the steps to let Apple TV pass through Dolby 5.1 surround sound from AVI files. How to stream AVI to Apple TV with 5.1 surround sound? Before going any further, let’s first be clear of what the formats are used for 5.1 surround sound. And there are two main formats that deliver surround sound for 5.1-channel systems. Like Dolby Digital, DTS provides 5.1 channels of digital audio. However, DTS uses less compression than Dolby Digital. As a result, some say that the sound produced by DTS is slightly more accurate than the sound produced by Dolby Digital. While most audio/video receivers will have both Dolby Digital and DTS, fewer discs and video games are encoded with DTS, compared to the number encoded with Dolby Digital. Therefore, to let Apple TV pass through 5.1-channel audio, your audio codec must be encoded with either Dolby Digital (AC3) or DTS. 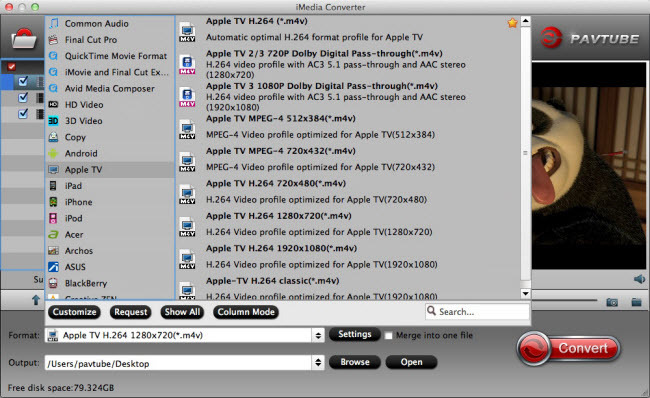 After searching on the Market, we finally settled on Pavtube iMedia Converter for Mac (review), the program not only assist you to convert all AVI files encoded with various different video codec like Divx, Xvid, DV, etc to Apple TV 3/4 playable file formats H.264 or MPEG-4 , but also allows you to adjust output audio codec to AC3 so that you can easily pass through Dolby 5.1 surround sound with Apple TV 3/4. For people with advanced technology, you can then flexibly adjust other profile settings like video resolution, frame rate, bit rate, audio sample rate, bit rate, etc to let them fit with Apple TV best playback settings. If you are not a tech savvy, never mind, our program can beneficially assist you to directly generate preset profile 1080p Dolby Digital pass-through format with the optimal playback settings for Apple TV 3/4 with just one click. If the AVI video uses an aspect ratio which doesn’t match the display screen of your TV, you will see black bars around the AVI video when viewing on TV via Apple TV, never mind, you can use the programs built-in crop function to change the output video aspect ratio to let them fit with your TV. 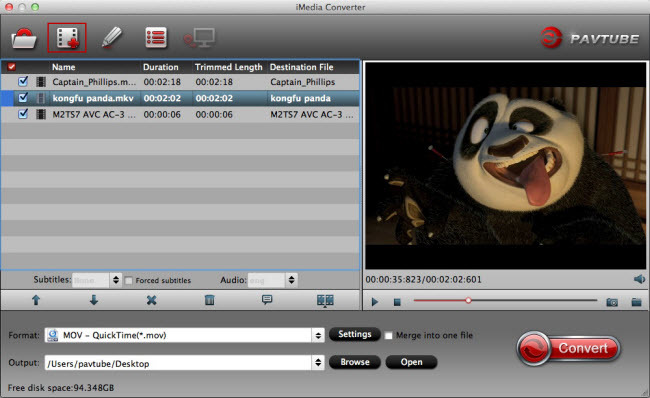 Pavtube iMedia Converter for Mac is pretty simple to use, anyone can learn to use it in minutes. In addition, it has perfect compatibility with the new Mac operation system – macOS Sierra. You can safely download and install it on your computer since it doesn’t feature any ads or bundled adware What’s more, the quality of the converted video is identical to the original video. How to Convert AVI for Apple TV Dolby 5.1 Surround Sound Pass Through? Launch the best Mac Video Converter for Apple TV 3/4 Converter on your computer. Click the button “Add Video” to add avi video files to it. If it is necessary, you can double click each file to have a preview. 1. If you have several video files and wanna combine/merge several video files for the Apple TV 3/4, you just need to tick off the “Merge into one” box. 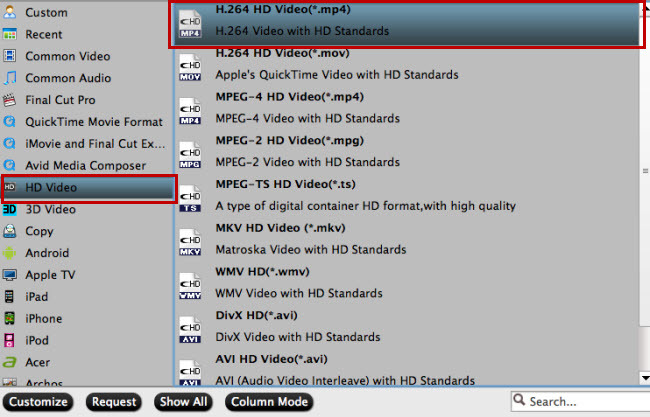 For advances users, you can use the program output Apple TV supported H.264 file format by following “H.264 HD Video(*.mp4)” under “HD Video” main category and then adjust the output audio codec as “AC3” in the program’s profile “Profile Settings” window and also other settings to get the best video and audio quality for Apple TV 3/4 playback with 5.1 surround sound. Click the “Convert” button; it will convert AVI to H.264 MP4 video codec and AA3 audio codec or Apple TV 3/4 preset Dolby Digital Pass-through format conversion process. When the conversion is finished, click “Open Output Folder” icon on the main interface to open the folder with generated files. You can then feel free to stream the files to Apple TV 3/4 with Dolby Digital 5.1 surround sound preserved. Next → Next post: How to Choose the Best Apple TV Converter for Mac?